Brian Lara has questioned the selectors' decision to ignore the pair of Dwayne Bravo and Sunil Narine for the Test leg of West Indies' India tour. According to Lara, Bravo had equal, if not stronger, credentials as an allrounder than West Indies captain Darren Sammy, who made only 25 runs in the series and went wicketless. More "baffling" was the omission of Sunil Narine, who, according to Lara, is the best spinner in Caribbean first-class cricket at the moment. Writing in his column for The Times of India Lara made it clear that he had nothing against Sammy's position and even had sympathy for the St Lucian, who he felt was unfairly dropped as ODI captain earlier this year. "I don't need any confirmation from Sammy, I know for a fact that his confidence was shattered and he started to wonder what's going to happen next," Lara wrote. "Well what we saw in the Test series is a result of this chain of events. A captain that looked lost on the field and his personal display especially with the bat, was one even he would like to forget." According to Lara the selectors had benched the wrong people and the consequences had badly hurt the team. "What about the Test squad selected for this tour? The very day that Sammy was elected as captain of the team it made it very difficult for someone like Dwayne Bravo to be considered. Dwayne hasn't played Test cricket for about three years now and knowing him closely it pains him that the selectors seem to only require him for the shorter versions of the game. 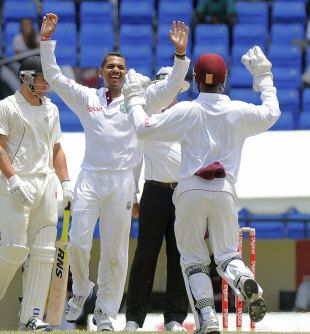 "A more baffling omission is Sunil Narine, the most successful bowler in West Indies regional 4-day cricket," Lara said. "You would think that he knows Indian pitches like the back of his hand. Another one of world's best cricketers labeled by our selectors as not good enough."